Desert Rally racing on two wheels is a test of strength, endurance, intelligence and heart. It takes the skills to be able to navigate varying terrain while traveling at speeds exceeding 90 MPH. Sounds grueling right? Now imagine this race taking place in the Sand Dunes of Peru, over 11 days and through a more than 3,100 mile course. Now that's EXTREME. 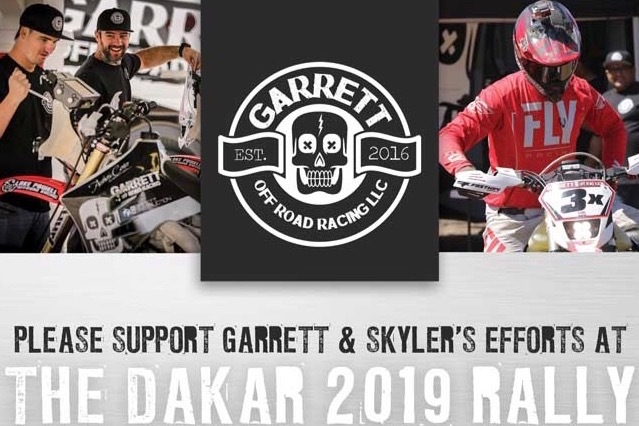 Only 3 motorcycle riders represented the United States in the 2018 event, now Garrett Poucher and Skyler Howes (both of Garrett OffRoad Racing) have secured their spots in the 2019 Dakar Rally. 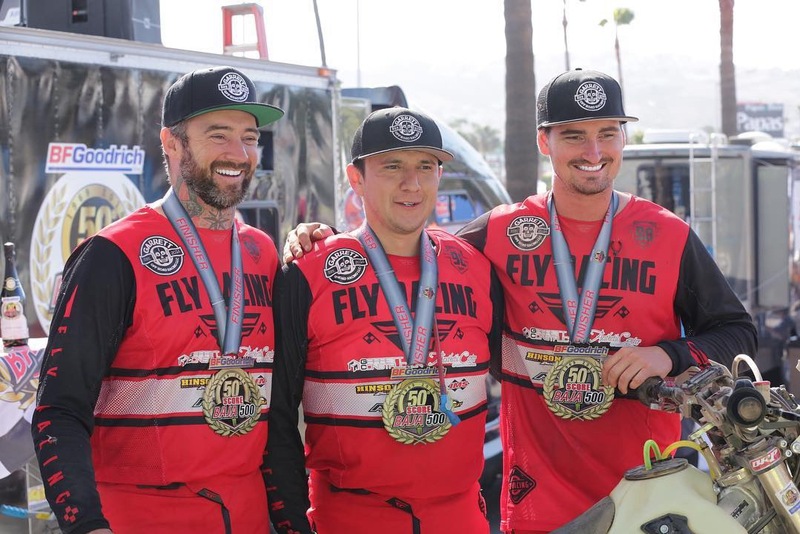 Garrett OffRoad Racing was established in 2016 and quickly became known for its accolades in the Baja 500 and 1000 races. They represent the 3x bike this year. They also expertly navigated and won Rally races in Sonora Mexico. These guys have the skill, fortitude, strength and know how...now the only hurdle to cross is the funding. The Dakar Rally (which is akin to Formula 1 racing on the international level) incurs expenses such as entry fees, motorcycle rental, pit crews, travel expenses, parts, supplies and more. With two riders entering this solo race, we need to raise twice the funds. The race starts January 6th, 2019 and the funds are needed by the first week of December. I was raised to be a very active person. I have been riding dirt bikes since I was in diapers, riding on the gas tank of my fathers motorcycle. We spent many vacations and weekends, riding in the sand dunes of Glamis, and across many of the deserts in southern California. We enjoyed motorsports, but we never got into the racing side of them. As a youth, I spent my time playing team sports. I started playing sports at the age of 4. Soccer was my passion for many years. I also enjoyed playing baseball, and in high school, I dabbled in football. My coaches all wanted me to continue with football, but once i was old enough to get a job, all I wanted to do was work. I graduated high school in 2001 and had my first child that year. I focussed on work and family, and in our spare time, continued to enjoy riding motorcycles with my family. In 2008 I became hooked on cycling and running. I would join in on local marathons and Gran Fondos over the next few years. In 2015, I decided to start racing motorcycles at local amateur motocross events and SCORE international events. I won some races on the local tracks, and competed in 3 SCORE races but did not finish any of them that year. So in 2016, I formed Garrett Off Road Racing and set out to beat Baja. I focussed on desert racing from that point on. To me, Dakar is the ultimate in endurance events. I started watching videos of the race in the early 90s and I have dreamed of being a competitor since then. I am drawn to events in which the physical, mental, and mechanical demands are so extreme that just finishing can be considered a win. 2 Day Rally training school for all levels beginner-expert. Perfect opportunity to learn rally or get some practice and refresh your skills! 12 rider limit! Sign up today to ensure your spot! Day 1: Intro to Rally, how to read a roadbook/navigate, how to highlight/mark your roadbook, put it all to the test! We have multiple small roadbooks mapped out for you to take this knowledge and put it to dirt. Garrett and Skyler will be sweeping the roadbooks to help with any issues and answer questions. Day 2: Refresher: go over the things you learned on day 1 and answer any questions of things you encountered. Long roadbook day! We have a long roadbook mapped for you to get a taste of what an actual rally day looks like. Put down a lot of kilometers and have a good day in the dirt! When registering, in the comment section please put whether you are using an ipad or a paper roll chart set up! 1 Day Rally training school for all levels beginner-expert. Intro to Rally, how to read a roadbook/navigate, how to highlight/mark your roadbook, put it all to the test! We have multiple small roadbooks mapped out for you to take this knowledge and put it to dirt. Garrett and Skyler will be sweeping the roadbooks to help with any issues and answer questions. Expert Level riders that just want practice, you are welcome to stick around and go over navigation class or hop straight to our roadbooks. There will be a short road book as well as a long one you are welcome to tackle. Group riding school perfect for improving your technique and skill to ensure you have a more safe and fun time on the bike! ​12 rider limit! Sign up today to ensure your spot! Supporters appreciation event at The Paseo Club on October 20th, 2018 at 6pm with food, drinks, music, the bikes, and silent auction. *Motorcycle tours of Baja California, MX are being offered. Details TBA soon!! Your support of these amazing athletes is appreciated!